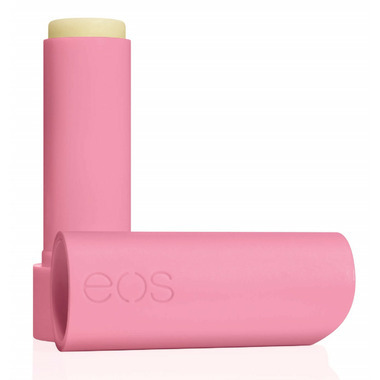 eos Organic Stick Lip Balm Strawberry Sorbet is 95% organic, 100% natural, and paraben and petrolatum free. 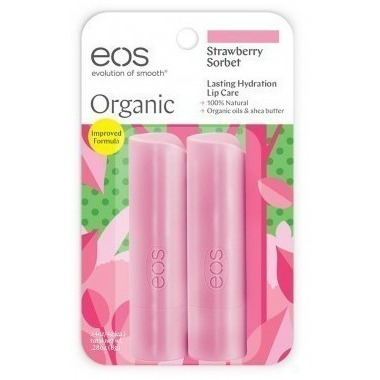 Packed with antioxidant-rich vitamin E, soothing shea butter and jojoba oil, eos Organic hydrates your lips and enhances your natural beauty. Ingredients: Helianthus Annuus (Sunflower) Seed Oil*, Beeswax/Cera Alba (Cire d’abeille)*, Cocos Nucifera (Coconut) Oil*, Butyrospermum Parkii (Shea) Butter*, Simmondsia Chinensis (Jojoba) Seed Oil*, Flavor (Aroma), Copernicia Cerifera (Carnauba) Wax/Cire de carnauba*, Olea Europaea (Olive) Fruit Oil*, Fragaria Vesca (Strawberry) Fruit Extract*, Tocopherol, Stevia Rebaudiana Leaf/Stem Extract*, Beta-Sitosterol, Squalene. Light lip chap with no color and a slightly stronger scent than Iâ€™d expect. They smell like those bright pink strawberry marshmallows from my childhood. I love this lip balm. Itâ€™s silky, non-sticky, had a great light scent. I love how my lips feel.